One of my new Sunday afternoon habits is to help myself to the Sunday paper while waiting for Alvaro's family. We do a lot of waiting on Sundays. Waiting for lunch. Waiting for company. Waiting for dessert. Waiting for everyone to wake up from their Sunday nap. Waiting for real time to collide with "Peruvian time". I do a lot of waiting, so I read the paper. These days aren't simply notes on a calendar, they are advertised, celebrated and showered with gifts. Everyone and everything has a day. On Sunday, the front page of El Comercio showed that a new group wants their day. A peaceful protest full of 500 colorfully dressed clowns marched through Central Lima on their way to Congress requesting that May 25th be declared "Peruvian Clown Day" to celebrate "all of the happiness that Peruvian clowns bring to children." As of Sunday, there's no word if May 25th has been officially declared "Peruvian Clown Day". I guess I'll have to wait until 2013 to find out. Monday morning it's back to my 5:30am alarm, long commute, private classes and adorable kids. Today I am sad for the loss of my vacation, but a beautiful day can easily make up for that. Especially when it includes a ceviche lunch, with an ocean view and my favorite guy in all the Americas. The different types of transportation available in Lima and the surrounding areas, are endless. There are big buses, medium buses and teeny tiny small buses. There are buses that run through the median and therefore are immune to Lima traffic. Some buses are new and some buses are very, very old. There are motorcycles of all shapes, makes and sizes. Motorcycles for one person, motorcycles that carry small cargo, motorcycles that carry large cargo and motorcycle taxis. There are big taxis, small taxis, single taxis and group taxis. Lima's newest transportation addition is a raised rail system that runs high above the traffic below. Take your pick, there's always a way to get around. 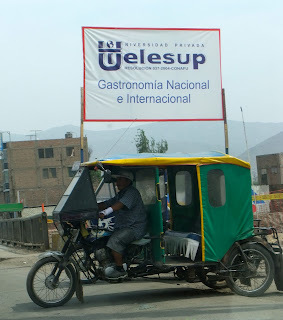 Since arriving in Lima, I have been fascinated by the mototaxi. These small taxis are perfect for maneuvering through small streets and quickly getting passengers from one place to another. While abundant in some districts of Lima, they are forbidden in others. For this reason, I have never had the opportunity to ride one. Until yesterday. This week while we are on break from school, I am helping a pediatrician missionary who attends our church. Part of his work in Lima is to go to various churches and schools and provide well check ups for the local children. These checkups first and foremost, allow the children to be seen a doctor, but also provide the mission organization with essential data regarding nutrition and health care, so that they can later tailor their help to the need of the area. Yesterday, as we were leaving the site, he suggested that we take a mototaxi to the nearest train station. And there it was, the moment I had been waiting for- my first ride in a mototaxi. All three of us crammed into the back seat of a taxi slightly smaller than the one in the picture above. With two tall, lanky gringo guys, several backpacks and myself, it was a tight fit. As our driver weaved through traffic, I felt a cool breeze across my ankles then noticed the door flap waving in the wind. We arrived at our station and saw a sea of other mototaxis waiting to take arriving passengers to their destination of choice. I squeezed through the small door, climbed out and safely landed on the sidewalk below. Now I can add "rode a mototaxi" to my list of Lima firsts. Hopefully, it won't be the last. 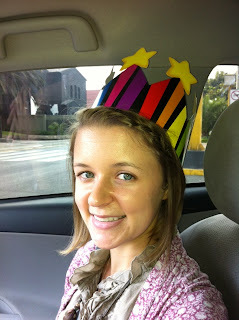 Our 1st graders wear birthday crowns, so why can't I? I wore my crown with pride the whole day. My recent birthday showed me just how much I love Peru. Last year on my birthday, I was four weeks removed from a disastrous, five month visa seeking process. I was mentally exhausted. One week prior, I miraculously landed my job at school, but was working 70-80 hours per week. Between my new elementary school job and teaching at the language institute, I barely had the time to notice my birthday. I was still working through issues of culture shock, financial instability, language insecurities and thinking "Can I really do this?" My birthday passed calmly and quietly, with very little fuss. As my birthday approached this year, I noticed one thing that was different: I was ecstatic. I couldn't wait to celebrate my birthday with all the people that are near and dear to me. The peace and joy that I felt with this birthday were completely opposite my feelings this time last year. 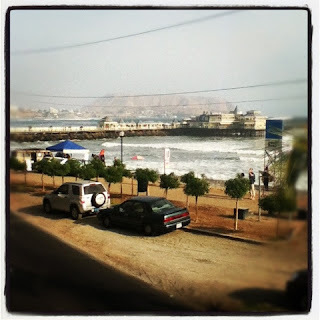 When I noticed how differently I felt, I realized how much has changed in my life in Peru. I have worked through my culture shock, I'm financially stable, I feel comfortable in the language and I finally know that I indeed can and will continue to do this. It was the birthday to top all birthdays, I had not one, not two but FIVE birthday cakes. How can you beat that? Alvaro pulled off the most amazing surprise party. Not once did I have the slightest suspicion regarding our plans for the evening. Up until the moment that the elevator door opened, I was convinced that we were simply stopping to pick up forgotten sunglasses and then on our way to dinner. When the door opened and everyone yelled "Surprise!" I was speechless. Well played, dear Alvaro, well played. It was the perfect birthday. I felt loved and cared for in every aspect of my life. This milestone was the ideal way for me to see the progress that I have made in the year. That too was the best gift I could have gotten. I have a love hate relationship with Peruvian public transportation. I love it because it's convenient. If you miss a bus, no worries, another one will be there in 30 seconds. It's incredibly convenient, expect when it's not. On those days that for some reason the only bus that goes that way simply isn't running. But then I love it again because the whole system is so ridiculous and I can't help but be fascinated by it. I have surrendered myself to the transportation monster. When I first moved here, I heard that you can get on or off the bus wherever you want. Just wave your hand if you want to get on and they will come to a screeching halt. If you want to get off yell, "BAJA!!" and they'll throw you off and start going again before your feet hit the ground. Over the last year, however, the city government has started a campaign to create more "official" bus stops, therefore eliminating some of the chaos. Sometimes the buses follow this and sometimes they don't, it generally depends on how strictly it is enforced on that route. I have started taking a new bus route to one of my classes and immediately noticed something interesting. The stop where I get on, is at a major intersection and makes logical sense because it is at the stop light of that intersection. The next "stop" is simply on the other side of the intersection. At first I assumed it was an anomaly, but it happens almost every day. They pick me up on one side at the "official" stop, cross the intersection (roughly six lanes of traffic) and stop again. But this time it's not at the stop light and when the bus stops the cars get backed up. Then the light changes and cars are stuck in the intersection. Then the cross section cars can't move. Then every car starts honking their horns as if all the noise can solve the problem. And people wonder why traffic is so bad here. Today as we were approaching this second "stop" a woman screamed, "Baja!" and asked to be let off. The driver didn't slow down. "Baja!" she continued and then a chorus of other lazy pedestrians began yelling "Baja! Baja! Baja!" Finally the coin collector fought back, "But there isn't a stop here." To which the first woman replied, "There is if there are passengers getting off." I was utterly intrigued by her logic. Lima public transportation isn't viewed as "public". There is a viewpoint held by some commuters that they have the right to ride the bus their way. Sit where they would like. Listen to certain music. Get on or off at a particular point. And even pay a certain rate. That is exactly what I find fascinating about the bus system here. Every bus is like it's own little community whether with peaceful harmony or rebellions. Yes, I have an hour long commute but it's certainly never boring. Early one morning on my way to school, I grabbed a familiar bus on a major road in Lima. There are a handful of buses that go the direction I need, so I generally just hop on one of them. When I first began my bus adventures, I would ask every time to make sure that the bus was going in the right direction. On this particular day, I didn't ask. I immediately paid my fare and told the coin collector where I was going. He collected my coins and we set out to fight the Lima traffic. This particular route goes straight for what seems like forever until it makes a slight right, a left and then I'm at school. At one particular stop, I noticed a bus of the same line in front of us. I sighed and knew that soon a battle for the road would soon ensure, resulting in me barely hanging onto my seat as the older-than-me buses fight for the title: King of the Pot Holes. However, this didn't happen. My bus turned left. And it turned left nearly 15 blocks before the usual right hand turn. "It's ok," I thought, "they want to get around the other bus." As we continued driving and didn't make any attempt to stop our detour, I began to think about the logic of a bus changing the route and realized it was impossible. So I sat there, staring out the side window, weighing my options. Do I stay? Do I get off? But I have no idea where I am. I will be late for school. Maybe they will turn back. Surely he is going back. Why do none of these locations sound familiar? After a few more turns, I saw a familiar street sign. The bus veered right and all my fears disappeared. That is until I realized the slight right turn was only to pick up more passengers and he in fact was turning left. Going far, far away from the familiar street. "Are you going to the shopping center?" "But you told me you were!!" Panicked, I jumped off the bus in the middle of the intersection and as my feet hit the ground, I heard a whistle, a "mamaccciiita!" and another whistle. Fantastic. I'm lost. Guys are whistling at me. It's too early for this. I'm carrying too many bags. What do I do now? I started walking down the road with a familiar sounding name and saw a bus stop up ahead. As I approached it, I noticed that the stop was nothing more than a dingy sign placed alongside a dirt median. The stop was covered in trash that welcomed all the dogs and none of the humans. I was standing there alone. None of the buses were stopping. This is when I began to panic. I quickly changed the game plan from bus to taxi, but soon noticed that the only taxis traveling on that road were "colectivos," which are group taxis that run a set route. I heard Alvaro's voice in the back of my head, "You are to never, ever take one of those." "No," he said shaking his head, "I don't go there." Out of sheer desperation, I begged, "Please, please, please." "Señorita, no, I don't go there." "Please!" I pleaded as I clutched my belongings and fought back tears. "Ok, I'll take you to a calmer street and you can catch a bus from there." "YES!" I screamed and jumped in the cab. It was only then that I realized I had not yet settled on a price. 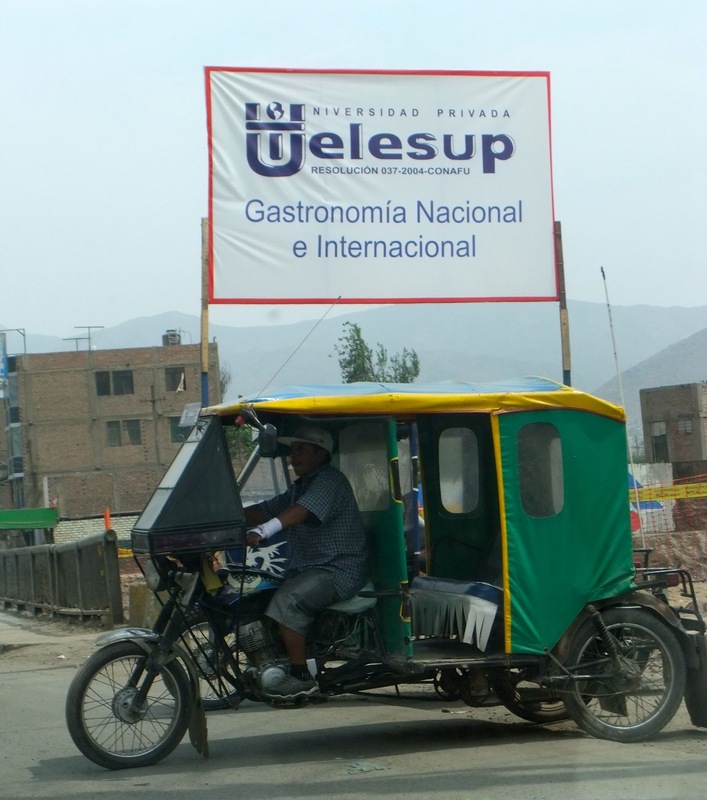 An amateur mistake in the world of Peruvian taxis where everything is negotiated. If you don't agree before getting in, you are at the mercy of the driver's price point. But at that point I didn't care. I would have paid anything to be taken away from the trash covered bus stop. I couldn't believe what I was hearing. Nothing? "Yes, nothing. I was driving this way anyway and you will never get a taxi on that street. It's better for you to be on this end of the avenue." I told him a little bit of my story, or as much as I could in my frazzled state. I was scared from getting lost. And confused about not paying for my taxi. And more than anything I wanted to be at school. I hopped out of his taxi and jumped on the first bus that I knew was going to school. Never mind the fact that it was packed well beyond capacity and I spent the first seven blocks standing on the stairs with nothing but a half open door protecting me from terrain below. I was on my way to school and that was all that mattered. I finally made it, still shaken up but then discovered that there isn't much that a hug from a first grader can't fix. Thank you, thank you, thank you to my sweet Peruvian taxi driver who fell for my begging and turned my nightmarish morning completely around.